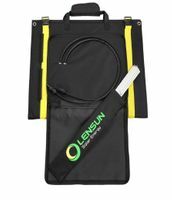 Lensun ETFE 100W Outdoor, 12V Ultralight Folding Solar Panel with MC4 solar Cables. Ideal for Everyday Life, Camping, Vans, RVs, Motorhomes, Caravans, Boats, Yachts, Cabins, and Sporting Events. 1. 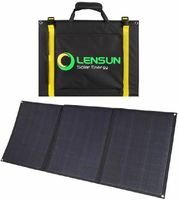 Fold-up to compact size self contained bag 58 x 44 x 6cm, only 1/2 of normal aluminum frame folding panels. 2. No frames or glass, Durable, Ultra-lightweight, Only 4kgs, only 1/5 of normal aluminium frame folding solar panels. 4. Made with latest technology ETFE laminating.The regularly uneven surface, produced by special processing, can absorb more light and looks more attractive in the meanwhile. 5. Four eyelets for mounting option, Innovative Metal Leg Support, keep the panel at optimum angle to get maximum performance. 6. 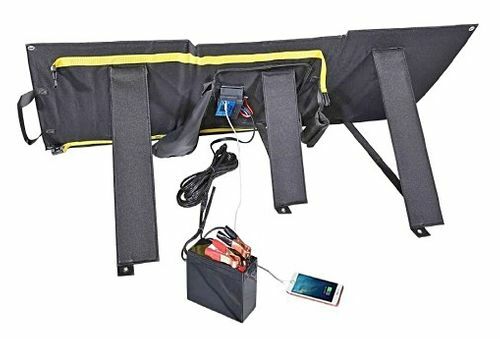 Folding Semi-Flexible Solar Panel, 2 x solar cable with MC4 connector for your own solar controller. Net. Weight: 3.7kgs | 7.47 lbs.